Rough Medicine is a very interesting and readable book, although the title is a bit misleading. It might better be subtitled "Surgeons on Whaling Ships in the early to mid nineteenth century". The first chapter deals with the seventeenth century surgeon John Woodall's publication "The Surgeons Mate". Druett makes some interesting comparisons about shipboard medicines recommended by Woodall and those carried on nineteenth century Whalers. It's remarkable how little changed over the ensuing centuries. After that first chapter the rest of the book deals with the experiences of surgeons on whaling vessels, drawn largely from the writings of a number of surgeons so engaged. It's an interesting read, chapters deal with surgeons relation with Captains and crewmembers, native peoples in the south Pacific, the actual business of whaling, accidents aboard ship, fighting scurvy, the ship's medicine chest and more. Surgeons of the Royal Navy and the East India trade get a few passing mentions. 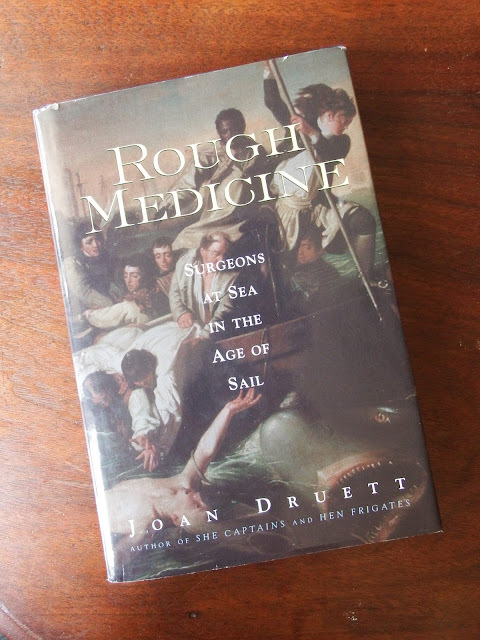 Although not focused on Naval surgeons specifically I recommend this book to anyone interested in shipboard medicine.